Will you one day be able to float this? 10/17 JZ Band at Three Creeks Brewing Co.
10/25 Rise Up's 3rd annual "Art for India"
Amy Clark's twins born today! Throughout January, Thump Coffee in downtown Bend hosts an exclusive sneak preview of “Push” skateboard decks customized by dozens of local, regional and national artists, including Adam Haynes, Mark Rada, Aaron Draplin, and T-Fly. The skateboard artworks will be auctioned in mid-February to benefit the Division Street Skatepark Project. 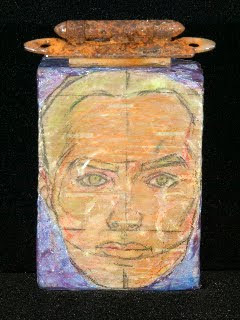 Complimenting the Push showing are mixed media works in two- and three-dimensions by Bend artist and educator, Lloyd McMullen. McMullen is a Print Associate at Atelier 6000, a fine art prints studio and artists’ workshop in Bend; one of the founding members of Artists Local 101, a Central Oregon-based contemporary art group; Visual Arts Program Director at Young Musicians & Artists, a Willamette University-based program. 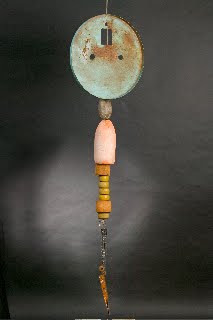 McMullen’s work is currently on display in the “On the Cutting Edge” exhibit at the Coos Art Museum. In Bend, work is on display in the “Paper Rock Scissors” show at Atelier 6000, and includes an outdoor installation, “Enlightenment”, at Gossamer, the Knitting Place. Recent invitational/juried exhibits include Atelier 6000, the 135 UP! gallery, and Central Oregon Community College in Bend, OR; the Art House Gallery, Atlanta, GA.; Maude Kerns Art Center, Eugene, OR; the Firehouse Gallery, Del Rio Council for the Arts, TX; and includes outdoor installations in Central Oregon. 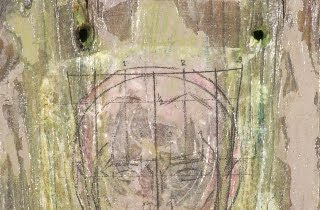 For more about McMullen and her work, visit her website. According to organizers, Push is modeled after a similar community skatepark project in Montana and inspired by Portland’s famed Burnside skatepark and similar DIY parks. “Though we have lots of sun here in Central Oregon, a covered skatepark designed, built, and maintained by skaters without the help of the parks dept, or the city is the goal,” say organizers. Situated on Division Street under the Bend Parkway, the land is currently vacant and strewn with large boulders. The project crew, comprised of volunteers who have dreamt of such an opportunity for years, has already formed a 501(c)3 nonprofit in order to secure grants and funds for building the park, which has already won the support of the Oregon Department of Transportation. For more information on the skatepark project, go to divisionstreetskatepark.org. Thank you for helping Rise Up provide empowerment through education in 2009! Whether it's been volunteering your time, purchasing clothing, painting, singing, financially giving, or providing your insightful ideas....We Appreciate It Very Much! Because of you Rise Up has been able to combat child labor & discrimination by providing free education for over five hundred vulnerable children in India & Nicaragua. It's been an exciting year being actively involved in our local community promoting emerging young musicians & artists, and hosting positive youth events. 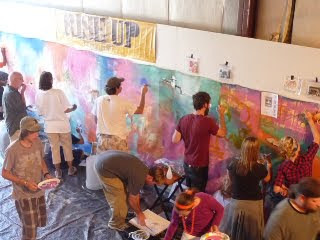 Rise Up is completely volunteer run and we need your ideas & creativity in 2010! This season please consider giving the gift of education. 100% of your donation will go directly to help an underprivileged child receive free education. There is still a day or two to order Rise Up clothing for the holidays. Much Joy to you and those closest to your heart during this holiday season! To learn more about Rise Up International's humanitarian efforts click here. bikers through advocacy, education and promoting responsible trail use." Moon Brewery this Thursday, December 17th. Done" tour! This band is truly a hidden gem in the music scene of Bend. unfortunately for CO music lovers, their last, so DON'T MISS IT! Just in time for riding season, Bend's own GearSlash.com hucks the summit of steez for people who want killer gear at down-to-earth prices - one steezy deal at a time. determine what goes on sale next." By working closely with hand-selected core brands – many based in the Pacific Northwest – GearSlash.com makes snowboarding affordable to everyone who loves riding with family and friends. GearSlash.com is the social way to shop for top-quality snowboard gear – and save big on snowboards, bindings, watches, outerwear, apparel, gloves, goggles and sunglasses. Here’s how GearSlash.com works: Only one product is for sale at any time. A clock indicates the amount of time left, and a counter shows the number of products available in stock for the featured item. When the featured product sells out or runs out of time, it’s replaced by the item at the top of the waiting list. Shoppers can vote for upcoming products, moving them to the top of the list – and into the featured spot. They can also get help from friends to vote an item up. By purchasing consecutive items, shoppers can save even more money by shipping multiple products in their single order. Plus, just like riders share secret powder stashes with their bros and sisters, at GearSlash.com they can easily share secret gear slashes. GearSlash.com brands include Airblaster, Anon Sunglasses, Academy Snowboards, Artec Snowboards, Ashbury Eyewear, Atmosphere Outerwear, Automaton Snowboards, Bent Metal, Celtek Gloves, Elm Company, Flux Bindings, GNU, Grenade Gloves, Holden Outerwear, IS Goggles Lib Tech, Lifetime Collective, Nikita Clothing, Nixon Watches, Roxy Snowboards and Union Binding. “Ride hard. But be kind to your wallet,” says the GearSlash.com team. John Paul Designs fort Bicycle Art Walk. The Downtown Bend Business Association invites bicycle fans to enjoy a special Bicycle Art Walk on Friday, December 11. Downtown business will display bicycle-themed art and other fun bike-related events will take place in conjunction with the 2009 National Cyclocross Championships in Bend, December 10-13. The Bicycle Art Walk event is in addition to the regular First Friday Art Walk downtown on December 4. For Bicycle Art Walk, everyone is encouraged to leave their cars at home and ride a bicycle. For details about bicycle art exhibits and other activities, check the new Downtown Bend Business Association website. to increase awareness of HIV/AIDS in the community. regarding the HIV epidemic on December 1.
) at Summit High School Tuesday, December 1 at 7:00 p.m.
steps to control their health if living with the virus. managing this long-term chronic condition. with HIV aren't aware they have the virus. test is available at several locations in Deschutes County. members. Call 541-322-7425 for more information. Deschutes River Manufacturing featured in Cascade Business News "Made In Central Oregon"
decking, or reloading, 100-foot-plus lengths. for effective weights that can hover over150 pounds. roller first launched onto the market in 2002.
the word on a global scale. inch hoses and comes with a reloader and portable stand. from stooping over to roll and lift. agencies and firefighters from Texas to Canada, including the U.S.
the hose for redecking it." less than an hour with The Rookie, Norman said. "I tell you what, that's a great machine that saves lots of time,"
then lays flatter on the truck than when you do it by hand." quality, industrial grade machine it is." also quickly becoming a hot market. safety issue for saving people's back, that sort of thing." sold to Alaska Fire Service. Reservation in Washington) and repeat customer Conoco Phillips in Texas. at 5:00. Hope to see you then! 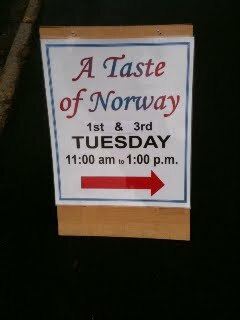 First and third Tuesday, 11am to 1pm, Sons of Norway Lodge, 549 NW Harmon Blvd Bend, OR. Call 541-382-4333 to confirm schedule. My grandfather, Olaf Skjersaa, immigrated directly from Norway, arriving in Bend, Oregon as a teenager unable to speak a word of English. Like many of our country's earlier immigrant generations, he was determined to learning English as quickly as possible to "fit in" here. 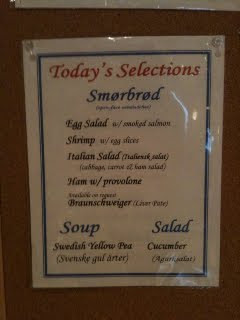 As a consequence, my family lost the ability to speak Norwegian in a single generation. My mother, Greta, and her siblings know only a few words of their father's native tongue. But also like many immigrant communities, food became a connection to the Old World, and I grew up surrounded by the tastes and smells of the Norwegian cooking my Grandmother Grace Skjersaa, Great Aunt Edna Skjersaa and my mother would serve at family gatherings. Now, the holidays are the time of year that me and my children join my mother in re-creating baked treats like the delicious potato flat-bead lefsa and delicately crisp, ornate cone cookies, kramakake. 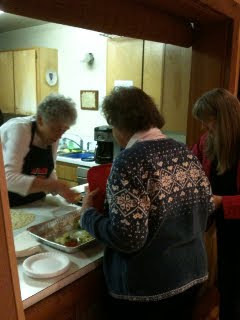 When my mother invited me to join her this week at the Sons of Norway Lodge for the Taste of Norway lunches member Barbara has been preparing on Tuesdays, I jumped at the chance. If you've never experienced Norwegian cuisine, you'll be pleasantly surprised to discover that it's far more diverse and tasty than the notorious lutefisk. 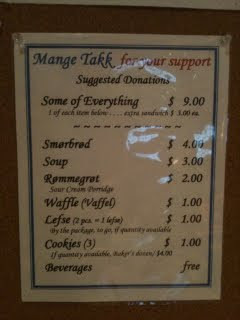 I recommend getting the "Some of Everything" sampler. 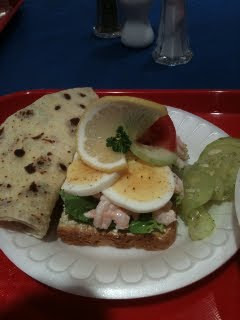 My "smorbrod" open-faced bay shrimp sandwich on rye bread, Swedish yellow-pea soup, lefsa and cucumber-dill salad were fresh and light, and the baked treats are some of the best from any any cooking tradition. latest from the Vima home at www.lupwahomes.org . NWVS #8 - At Home In The Gorge from CRG Video on Vimeo. 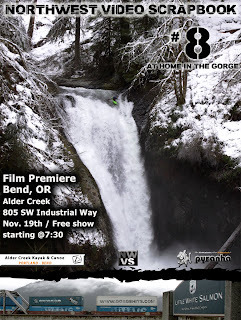 Free premiere showing at Alder Creek Kayak & Canoe in Bend. Movie night at Alder Creek! 7:00-8:30 @ Bend Alder Creek movie is FREE. Cotes du Rhone is probably the most diverse wine appellation in France. The appellation encompasses much of the land of the area, not to mention much of the wine - over two-thirds of the wine produced in the Rhone Valley is of the Cotes-du-Rhone appellation. Dennis Sienko of Bend Wine Cellar will guide us through a selection of these wines, and Chef Tim will create some delectable dishes to pair with them. 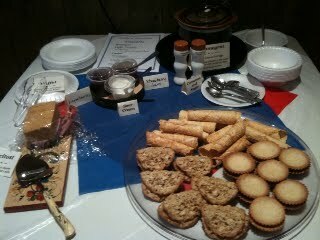 WTW meets on Monday, November 16, from 4:00-6:00 pm, at the Jackalope Grill. Please arrive 15 minutes early for Women Tasting Wine. Cost is $45. For reservations, please contact Diane Sienko at Bend Wine Cellars (388-7564), or go to the Women Tasting Wine website. The Jackalope Grill will be open on Thanksgiving, serving a traditional turkey dinner, as well as items from our regular menu. Seating will be from 1:00 to 5:00. Please be advised that lower Ben's Trail will be closed for repairs from the trailhead up to Rd4610 which is the intersection with Express this weekend. Please plan your rides to avoid that section. Both Saturday and Sunday crews will be working to add drainage and repair beat sections of the trail. We would love your help on Sunday to help hand finish the work. Tumalo Langlauf Club membership drive/fundraiser, this Saturday, Nov.
7th, 5:30-8:30 at the Boy's & Girl's Club- 500 NW Wall St.
Come see the new groomer! Hope to see you all there! Please pass this along to all your friends! Nov. 6-14: "Godfather" Inspired Interpretation of Shakespeare's "Macbeth"
PLEASE FEEL FREE TO PASS THIS INFO ON TO ANYONE I REPEAT ANYONE WHO MIGHT BE INTERESTED. 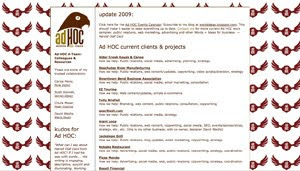 WORD OF MOUTH IS OUR BEST--IF NOT ONLY REAL ADVERTISING! THANK YOU SO MUCH!!! Come Join Summit High School Performing Arts Department for our production of William Shakespeare's "Macbeth". This version of this chilling tragedy uses the original language but the setting has been inspired by Francis Ford Coppola's "Godfather" movies. Sculpture garden? Low-water xeriscape landscaping? Business signage? How about all three? Mother’s Juice Café’s latest contribution to Galveston Avenue neighborhood beautification blends art, sustainability and commerce. Under the shade of a “Mother’s Juice Café” sculptural metal tree flourishes beds of sculptural metal flowers with small placards for Open, Espresso and other simple messages. Mother’s Juice Café owner Mike Sackin tapped into his landscaping background to collaborate with Bend metal sculptor Andy Wachs at Weld Studio on the modern designs. “We worked with the Mother’s tree-inspired logo to create a modern sculpture that also serves as signage in an organic way,” says Wachs. “It simulates a tree and plant forms and incorporates local landscapes for a playful, eye-catching blend of signage, garden and art,” Wachs explains. The signs are constructed of steel and aluminum with traces of patina and rust to blend in with the surrounding Central Oregon desert environment. Mother’s owners Mike and Janet Sackin, are also committed to supporting the local arts community by providing their venue as a platform for local artist to feature their work monthy. “With our new sculpture garden emerging out front - we hope the community can be inspired to bring art into any environment,” states Mike Sackin. Mother’s Juice Café is located on Bend’s west side at 1255 NW Galveston Ave. For details, visit www.mothersjuicecafe.com or call 541-318-0989. Dozens of downtown Bend businesses will glow with the welcoming warmth of Autumn during the Downtown Bend Business Association’s monthly First Friday Walk on November 6. Art exhibits, artist receptions, live music, food and beverage samples and other events are open to the public free of charge throughout the evening. Derek Anderson light paintings photography. Handmade chocolate truffles, wine and 2010 swim and resort wear lines. Lisa Mason color pencil drawings and acrylic paintings. “Have you ever been this tired?” photo prints. Steven and Elyse Douglas gem show featuring Oregon Sunstone from Douglas mining claims. Holly Grigg-Spall acrylic paintings. Music by French troubadour Eric John Kaiser. Artistic knitted items. 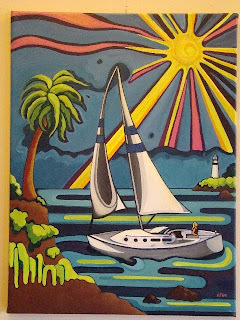 Sue Favinger Smith “Perception and Imagination” oil paintings. Music by Erin Cole-Baker, acoustic mix of bluegrass, jazz, blues and rock. Kate MacLeod new glass works. Susan Mobley original watercolors and handpainted silk scarves and neckties. Karen Wright jewelry, Karen Brock designs, Stephanie Photography travel and nature photos. Custom-designed jewelry and original abstract acrylic paintings. 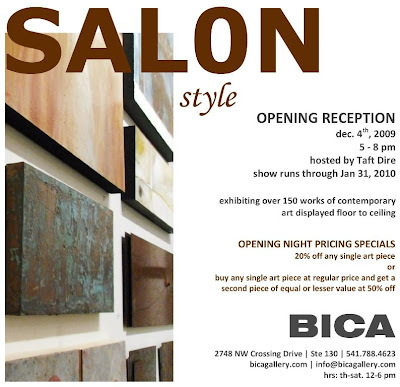 Artist TBA from BICA Gallery. Nikki Hoke Horner abstract interpretations of topographical mapping. Linda Gillard plein air pastel landscape paintings and figurative wire sculptures. Kristin Klus hand-tinted darkroom prints and digital photography. Read the full article, "Will you one day be able to float this? " here. 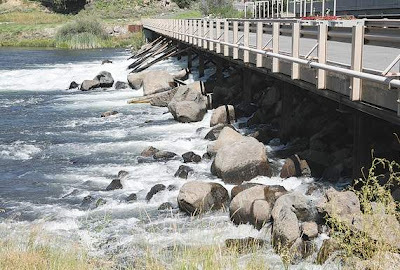 To Learn More: The Bend Park & Recreation District will hold an open house on the Colorado Avenue Dam report from 5:30- 7 p.m. Thursday in the district's Community Room at 799 S.W. Columbia St. in Bend. To see the consultant's report on the Colorado Avenue Dam improvement project, visit www.bendparksandrec.org/Planning__Development/Colorado_Dam_Report/. People with questions or comments who can't attend the open house can contact Bruce Ronning at 541-706-6113 or ColoradoDamReport@bendparksandrec.org. Kristin Klus Photography at Thump Coffee, throughout the month of November 2009. A native Oregonian who grew up with a strong love for the outdoors, Klus discovered a passion for photography in a high school photography class, and she pursued both academic training — earning a degree in photography — and hands-on experience working at a camera shop while attending Central Oregon Community College. Klus’s work has been published in Photographers Forum magazine, and her photography can be found in businesses and private collections throughout Central Oregon. Visit her website at kristinklusphotography.com. Thump Coffee is located in downtown Bend at 25 NW Minnesota Ave. For details about art exhibits, coffee cuppings and other events, visit www.ThumpCoffee.com or call 541-388-0226. 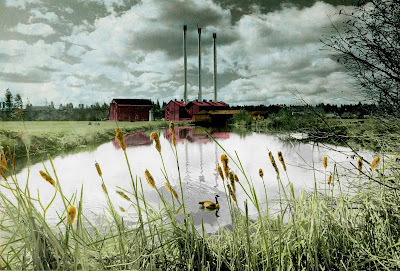 Photo Caption: “Historic Old Mill” by Kristin Klus (hand-tinted black-and-white darkroom print, 12”x18”). “This photo was taken nine years ago. The pond has been bulldozed, and new buildings have blocked this angle entirely,” says Klus. to discuss the new draft Plan to obtain feedback from County residents. Oct. 19	Community Plan	Terrebonne Grange Hall, 6:15 p.m.
Oct. 20	Community Plan	Tumalo Community School, 6:00 p.m.
http://www.deschutes.org/cdd , under "Comprehensive Plan Update." 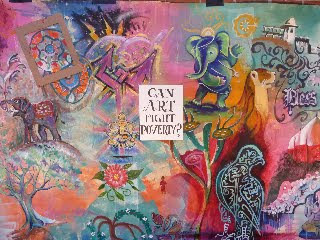 You are invited to Rise Up's 3rd annual "Art for India," on Sunday October 25th. Join us for one of Bend's largest art events. The evening will feature artwork by thirty of Bend's most talented artists and features an additional youth mural by children & teens from our local schools. This fun benefit helps fight discrimination and poverty by providing free education for over 250 underprivileged children in Bodhgaya, India. This all age show starts at 5pm at the old Boomtown location, on the corner of Greenwood and Harriman (across from the Blacksmith restaurant). Come pick your piece of the canvas! Hosted by MC MOsleyWOtta and live music from Chris Chabot, Leif James and the Autonomics! Eats, Libations, Silent Auction, and a Media Presentation about the school in India. Tickets are: $15-Adults, under 21-$10, and under 10-Free. Tickets are available online at:www.riseupinternational.com - at the door - or at Visit Bend. (Bend, OR) For the first time in Bend, local photographer Brian Daly exhibits his lilliputian photographic scenes in a solo show at Mother’s Juice Café throughout October. This series of photos depicts scenes created with miniature models ½-inch to 1-inch tall – people, cars, buildings, trees and other tiny figures, mostly “from my children's toys, or an old train set,” says Daly. For more Brian Daly photos, visit briandalyphoto.com. 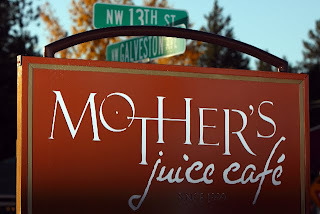 Mother’s Juice Café is located on Bend’s west side at 1255 NW Galveston Ave. For details, visit mothersjuicecafe.com or call 541-318-0989. Some say oysters are an aphrodisiac, and while we invite you to decide for yourselves the myth's veracity, we know for a fact that they are delicious and lend themselves to a variety of presentations and preparations. After much thought and reflection on this princely mollusk, Chef Tim has developed another inspired menu for your enjoyment! Please call soon to reserve one of the remaining places available for this special night of delicacies from the sea, paired with outstanding wines. Cost is $80 (including wines and gratuity), and we request payment in advance so the evening is more relaxed and enjoyable for all. Dinner starts at 6pm. Since Monday is a holiday, we'll be open for regular dinner hours on Sunday, October 11. Come enjoy Sunday dinner at the Jackalope! Reservations: 541-318-8435. Recipes, info and more. also be live music from Chris Chabot, Leif James and the Autonomics! under 21-$10, and under 10-Free. If you would like to help volunteer for this event, Please contact me. Come Support the Straw family through this tough time. Five month old baby Gavin will be having massive brain surgery on October 13th. Our lovely friends are hosting a fundraiser for Gavin and his family to help with medical expenses. Lovely donations from: The Tower Theatre, Bambini, Spork, Plum, Pave Jewelers, Vanilla, Soba, Bouncing off the Walls, Alpenglow, Scrappin' Along, Utilitu, Tan Republic and manymore! 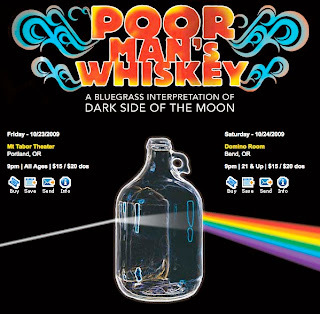 What a great way to get ready for Halloween - as you're encouraged to wear your favorite Wizard of OZ costume and enjoy a bluegrass interpretation of the Pink Floyd classic "Darkside of the Moon"! Come on out, whether you're in Portland or Eugene! Both shows are expected to sell out, so get your tickets early! 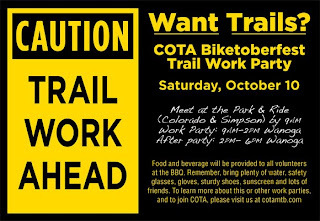 COTA and I sure could use your help on 10/10 for a morning of trail work. For this year's Biketoberfest, I'll be leading a crew up Farewell. If you've been up there recently you know Farewell has had a hard summer and could really use some love to get it ready for next year. I know many of you have been out riding and running the trails for the last 6 months or more... how about giving back a few hours of your time to help maintain this amazing resource? Since relocating to the Bend area from her hometown of Yakima, Washington, LaBissonier has been involved with Poethouse Art, where she has been a resident artist and art class coordinator. Visit her studio at Poethouse Art, or go to www.lorilynnart.com. Powderwhore Productions once again brings their brand of skiing to Bend. This year's offering, Flakes celebrates the deep and light powder from around the world that the audience has grown to love, blended together with the often flaky characters that thrive on this wintry existence. The grand finale is a raffle with all proceeds to benefit ONDA. Come show your support and celebrate the beginning of the winter! For September, WebCyclery brings you the Central Oregon premiere of Bicycle Dreams. This incredible story follows the Race Across America - a grueling, 3000-mile bicycle race from the Pacific to the Atlantic. Top riders finish in under 10 days, riding over 300 miles per day and sleeping only a few hours per night. Webcyclery's own Kevin and Mean Todd praised and heralded it as "The sweetest Race Across America movie ever!" mentors for children with an incarcerated parent. kids today will result in fewer people incarcerated in the future." On Saturday, September 26, COPY will offer a training class in Bend. matched with a child living in their local Deschutes County community. "Since 2007 was such an incredible year for white varietals, the September 21 WTW Seminar will feature 2007 Oregon White Wines from Penner-Ash, Lumos, St. Innocent, Elk Cove and Bergstrom Wineries. The weather is still warm enough to enjoy a selection of white wines, so we're taking advantage of these lovely 2007 releases." 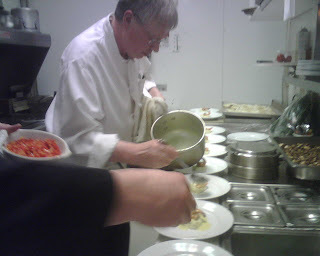 As always, Chef Tim will create some delicious complementary dishes to pair with these outstanding Oregon wines. WTW meets on Monday, September 21, from 4:00-6:00 pm, at the Jackalope Grill. Please arrive 15 minutes early for Women Tasting Wine. Cost is $45. For reservations, please contact Diane Sienko at Bend Wine Cellars (388-7564), or go to the Women Tasting Wine website. If you haven't registered for Wilderness Day yet, what are you waiting for? 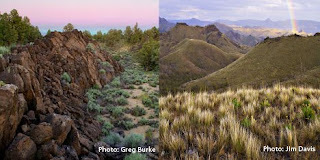 There is something for everyone; join ONDA, Friends of the Badlands, East Cascade Bird Conservancy, Photographer Bruce Jackson, and fellow desert lovers in a day of education and appreciation of our desert wildlands! Trips will take place in both the Badlands Wilderness and nearby proposed wilderness areas. ONDA believes in equal opportunity conservation and welcomes everyone to fall in love with their desert lands. All activities are FREE to the public. After your trip join us at The Environmental Center at 16 NW Kansas Ave from 3pm-6pm for an after-party with food, beverages and music by Third Eye Whiskey. The Environmental Center's largest fundraising event of the year is around the corner! Join us for an evening of festivities that includes food catered by CHOW, Lemon Drops by Bendistillery, Games by Savvy Casino, fabulous auction items from local businesses and much more! This event will sell out! Limited tickets are now available for purchase. 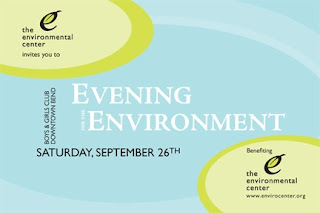 Please visit www.envirocenter.org for more event details and to reserve your space today! The 2009 Bend WebCAM, Presented by StreamiT! - Early bird registration has been extended toThursday, September 17. AdFed members save $30 off regular pricing! Register today and join some of the most innovative minds in the country on October 15 & 16 at the Riverhouse Convention Center. Bend WebCAM will enrich anyone involved in the Web and Creative & Marketing industries; especially those who realize the inseparability of the two in a successful 21st Century business plan. It's Bend Roots time again! The dates have been set, the acts have been booked, and The Vic and Parrilla are ready to rock! As a project of KPOV, Bend Community Radio, all Revival performances and workshops are free and open to the public. This event is underwritten by pure community giving and effort, and hosted byThe Victorian Café and Parrilla Grill. Nestled into one of Bend's oldest west side neighborhoods, eight performance areaswill host more than 70 (yes 70!) local acts and workshops. Click here for the schedule of performers, workshops, stages and show times. 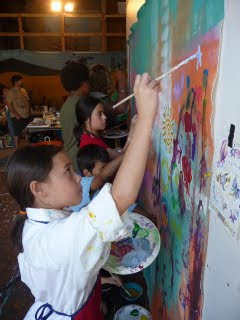 Many workshops are offered throughout the weekend and Sunday is focused on kids and families. This year we are pleased to announce that Victor Johnson will be performing and helping out with the Kids Music Workshop. Victor is a renowned kids music performer and Putamayo recording artist who has made a career of kid's songs. Based in the Dalles, he is a bright light for sure, and a neighbor our performing arts community can learn from. Support local music, and have a rockin' good time all weekend long at Bend Roots Revival!